What we had for lunch (and dinner) during my nth birthday! I remember having a conversation with a friend years ago. It was around this time - 2:00 in the morning, when we would have coffee break outside our office in Eastwood. Angeli would tell me about her plans of setting up a catering business and I would tell her about wanting to write more stories and traveling more. After two years, here I am writing about her story. Sab's Party Trays was born named after her daughter Sab. I was thrilled when she told me that she would send me samples of her food offerings. I just invited her to cook for my birthday party #HarryBirthdayRuth and she gave me a big blow out at home. Good thing for mom who had a day off from the kitchen. She didn't need to worry about what to cook for us on my birthday. Angeli asked me to pick the dishes I want. 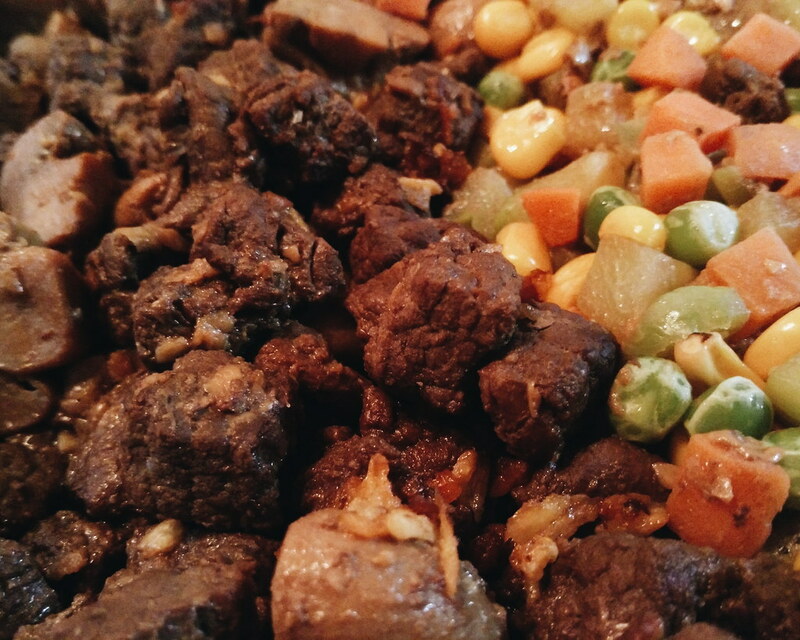 I only chose two dishes that we seldom have at home - the Salpicao and Beef Stroganoff. 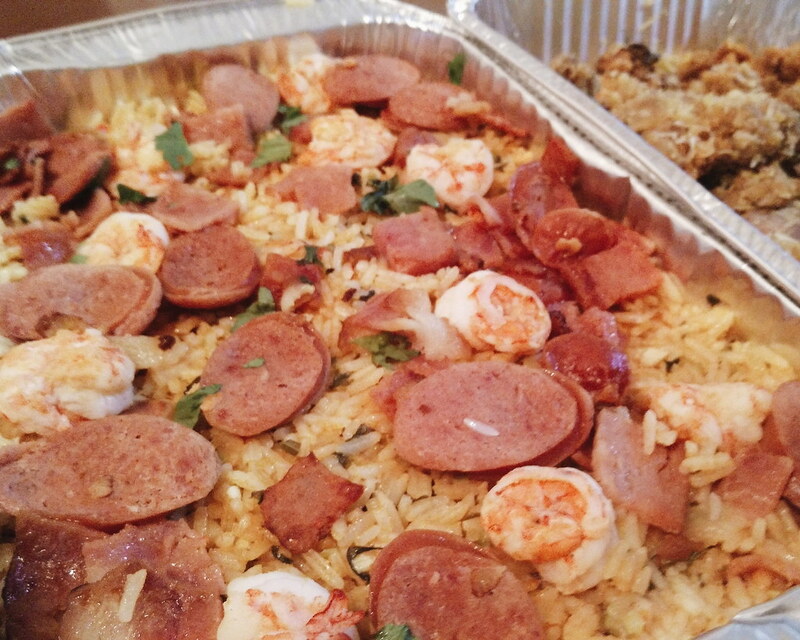 Then she suggested something from the Chicken Dishes and the bestseller - Shrimp and Sausage Jambalaya. She scheduled the dishes to be delivered at home on my birthday (how sweet!). 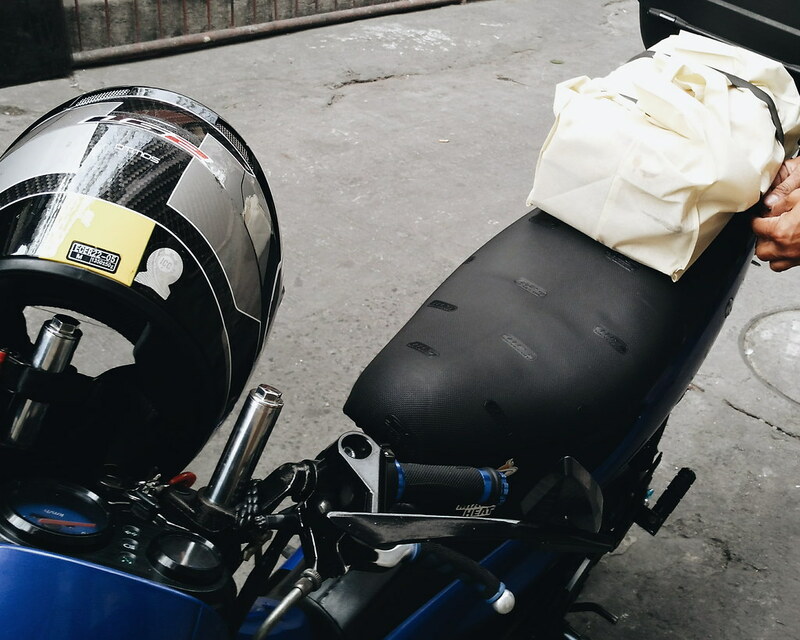 Thankfully, there's GrabExpress to deliver all the good food! 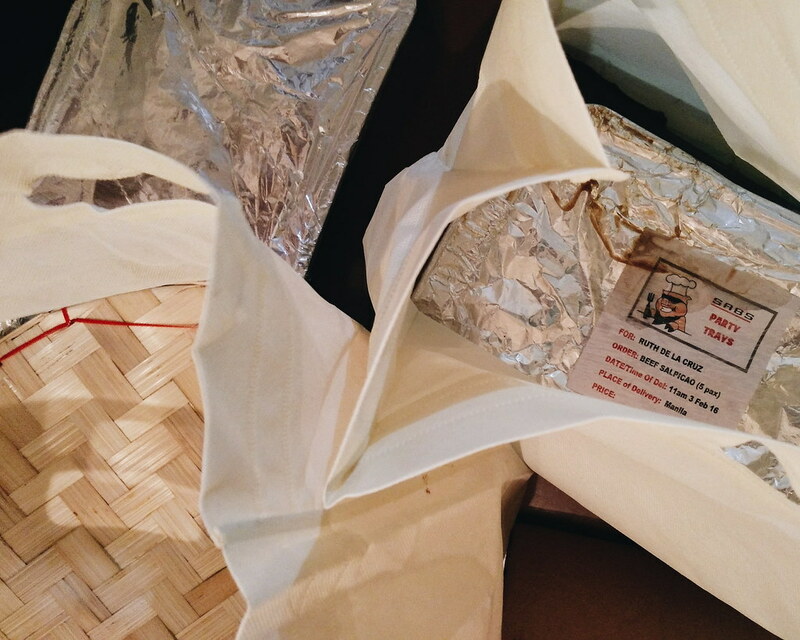 Food was carefully packed and secured. I love that they were delivered freshly cooked and still warm (thank you GrabExpress!). 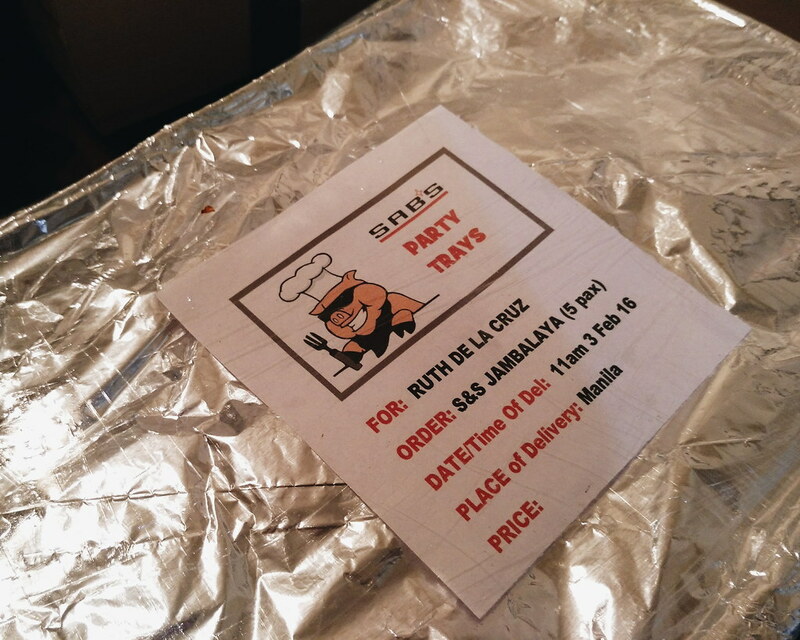 Sab's Party Trays even provided woven tray (bilao) for my Jambalaya. But the trays itself made a good platter for our very intimate family lunch. I have to tell you, I got so excited over the food (and I am seriously craving for some Salpicao now!). Beef tenderloin stir fried and topped with toasted garlic. I was in Cloud 9! It is served with buttered button mushrooms & mixed vegetables. I would eat it anytime! 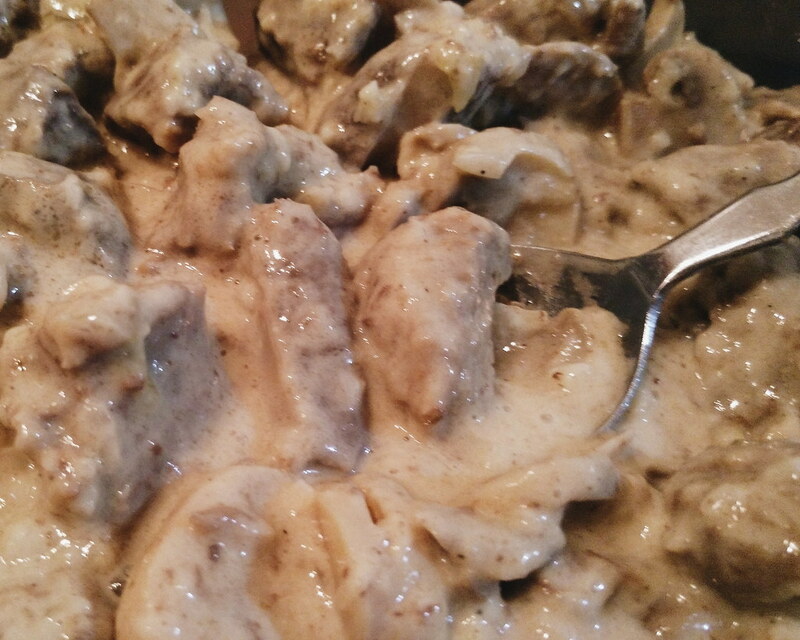 Tender strips of beef and mushrooms sautéed in butter with creamy sauce. I find it too creamy (which means Sab's Party Trays does use premium and generous ingredients for the recipe). My brother approves it and I love it too! So I heard that it is an old family recipe. 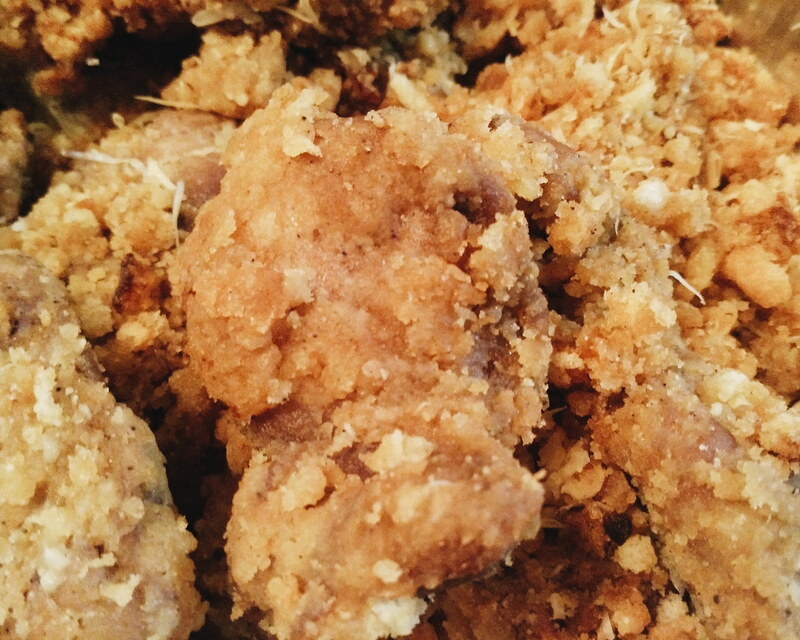 I thought it was just the usual fried chicken but it has an interesting flavor of sweetness. The secret is in the special sweet breading of garlic, peppercorns, butter and melted cheese. It is not fried but microwaved for perfection. I am not really a fan of paella but this is an interesting offering instead of having the usual pasta. It is a creole dish packed full of shrimps, Andouille or keilbasa sausages, vegetables, herbs and spices. There's so much flavor and color in this dish. It does look inviting and it didn't disappoint. My Tatay who is picky with food gives it a thumbs up! These are just few of the offerings from Sab's Party Trays. They also offer favorites from their Appetizer's list like Beer Battered Fish 'n Chips with Ranch Dip, Deep Fried Calamari with Garlic & Lemon Mayo, and Nachos with Cheese Sauce & Pickled Jalapenos. For main dishes, you can choose from different Beef, Pork, Chicken and Seafood dishes. There's a selection for Vegetables Dishes and even Pasta (red and white sauce options available). You can check the complete Menu listing. I find the menu affordable and perfect for parties, get-togethers or potluck. Sab's Party Trays was actually in my very magical #HarryBirthdayRuth party. 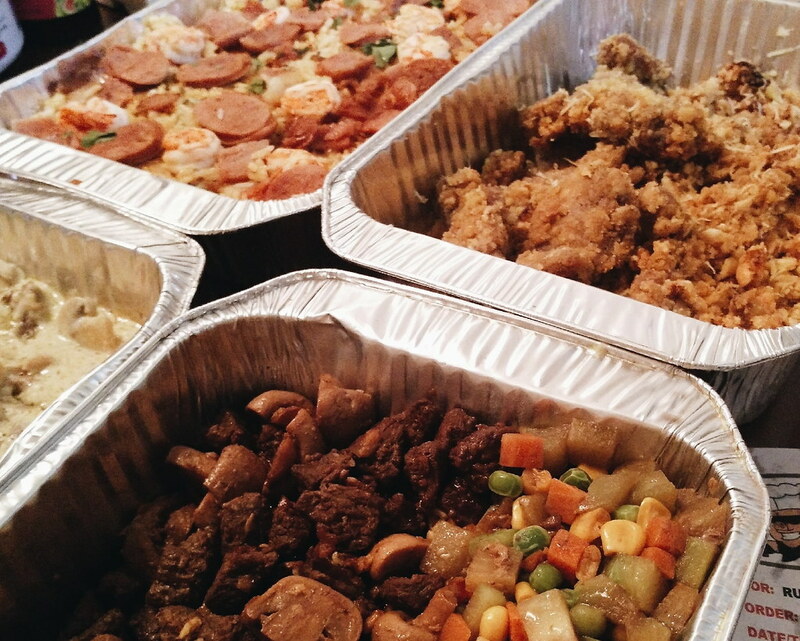 I know my pictures didn't give much justice to the good food that were delivered by Sab's Party Trays. But trust me, they are #ruthapproved! Got party? Check out Sab's Party Trays! PS. Angeli is super nice and bubbly person. You would love her.